Until the twentieth century, educated Indians and Westerners alike tended to disdain the occult practices denoted by the term “hatha yoga.” “We have nothing to do with it here, because its practices are very difficult and cannot be learnt in a day, and, after all, do not lead to much spiritual growth,” wrote Swami Vivekananda, who did much to popularize yoga philosophy in the West with his 1896 book, “Raja Yoga.” Only in the modern era has hatha yoga been transformed into a wholesome, accessible regimen for health and well-being. 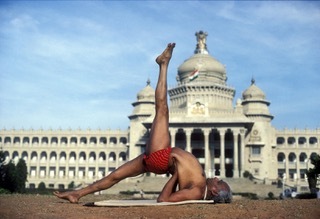 A central figure in this transformation was B. K. S. Iyengar, the author of the 1966 yoga bible “Light on Yoga,” who died this week at the age of ninety-five. No other yoga teacher, however, was as influential as Iyengar. His “Light on Yoga,” with a foreword by Menuhin, remains unparallelled as a guide to asana practice. As a Yoga Journaltribute put it, when “teachers refer to the correct way to do a posture, they’re usually alluding to the alignment Mr. Iyengar instructs and expertly models in his book.” In “Light on Yoga,” Iyengar describes yoga as a “timeless pragmatic science evolved over thousands of years dealing with the physical, moral, mental and spiritual well-being of man as a whole,” and calls Patanjali’s “Yoga Sutras” the “first book to systematize this practice.” The desire to imbue his methods with ancient authority is understandable, but Iyengar was too modest. It was he, not any ancient sage, who figured out how to show people the world over the safest way to stand on their heads.